To work efficiently, Portable Farms® Aquaponics Systems require ‘warm water, fresh water fish’ of some kind to provide the essential waste and their nutrients for your plants. Generally, aquaponics systems use warm-water fish instead of cold-water fish (like trout) because the plants don’t like the cold water. Portable Farms® raise Tilapia which are a delicious white fish with a mild flavor. They require between 7 and 9 months to grow to harvest size at 1 1/4 pounds (.5kg) to yield two, four-ounce (113gm) fillets. 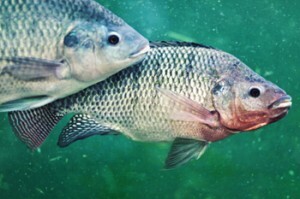 Tilapia is the common name for nearly a hundred species of cichlid fish from the tilapiine cichlid tribe and range in color from white, pink, salmon colored, dark gray and brown. The word aquaponics comes from words aquaculture, which is the cultivation of fish or other water- based animals, and the word hydroponics, where plants are grown in a sterile medium or completely in water. By combining the fish, water and plants, Portable Farms® Aquaponics Systems use an integrated environment to produce vegetables and fish in very small space, with very little water. Aquaponics has its roots in ancient China and parts of the aquaponics system were developed in other areas of the world where high concentrations of people lived who were observant of the relationships that existed naturally in their environment. In China, farmers knew that land livestock waste could be added to their fields or ponds to increase production of vegetables and fruit bearing plants. They also noticed that different fish had different tolerances to the level of land-animal waste in their water. For example too much pig or chicken waste caused many fish to die (the modern explanation for this is lack of oxygen) so they were careful about balancing their system for maximum yield and minimum fish loss.These Chinese farmers were able to refine their systems so they could grow chickens in pens above pigs, (with the waste dropping through along with any spilled food) who were in a pen over a pond with carp in it, and then the water flowed to another pond with other less tolerant fish such as catfish, and perhaps other aquatic animals and certainly other water plants were grown and harvested. These systems were so called flow-through systems, meaning that water was used once through the ponds, and then released to the local paddies, streams, lakes or ocean. The sludge from the bottom of the ponds was used on the fields and some of the water was used in the paddies for fertilizer before it was released. In the twenty-first century, the world faces an environmental crisis, issues related to climate change (drought and flooding as well as record-setting heat waves) and an energy crisis. 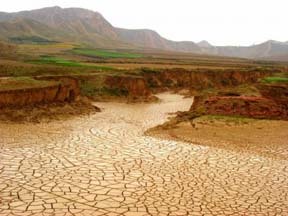 In addition, many parts of the world face severe food shortages. Twentieth century agricultural techniques have harmed the environment and consume an inordinate amount of energy and water. 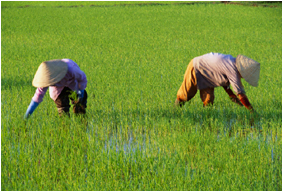 Many countries lack the large amounts of arable land and water needed to sustain growing human populations. Developed nations use large amounts of pesticides and artificial fertilizers to grow their grains, fruits, and vegetables. At the same time, they use huge amounts of gasoline and diesel fuel to power their farm machinery, large amounts of electricity to process their food, and enormous amounts of fuel to deliver the processed food to grocery stores. The raising of farm animals, particularly cattle and swine, is notoriously inefficient in terms of the amount of land and energy required to raise corn and other animal feed for each pound of protein produced. UN reports tell us that in 2012, for the 6th time in an eleven-year span, the world will eat more food than it produces. With 7 billion people in the world now and the expanding population growth of the projected 9.3 billion in 2050, there must be a shift towards vegetarianism and the option for farm-raised fish as a protein source for many, and a shift away from meat heavy diets, but this will take time. Growing crops to feed cattle, pigs, lamb or sheep take up more land and emit more greenhouse gases than producing crops for direct human consumption. In the 21st Century, food production accounts for up to 29 percent of man-made greenhouse gasses; twice the amount the United Nations has estimated comes from traditional ‘dirt’ methods of farming. Many areas of the world, such as California, require elaborate and expensive aqueducts and irrigation systems to deliver potable water to farming regions. A tremendous amount of fresh water evaporates or is otherwise wasted with conventional farming methods. Third world countries often lack the financial resources, arable land and technology to produce sufficient food, and in particular enough protein to maintain the health of their human populations. There are also health concerns raised by humans consuming pesticide residues on fruits and vegetables and hormones in chicken, pork and beef. Wild birds and animals are adversely affected by pesticide and fertilizer. Local waters (ponds, rivers, and streams) are also polluted by the runoff from the pesticides and fertilizers used for local growing. • Substantially reduces energy consumption for planting, harvesting and shipping food, and greenhouse gas emissions. • Also, provides jobs for local people strengthening the local economy. Aquaponics has been explored for several decades as a possible solution to the foregoing environmental, energy and food shortage problems. Aquaponics combines the art of growing aquatic animals (fish), known as aquaculture, with the modern technology of hydroponics in which plants are grown without soil. In aquaponics, fish and plants are grown together in an integrated closed loop re-circulating system with a very low rate of water usage or water loss due to evaporation. The fish waste (effluent) produced by the fish is delivered from the fish tank to a settling tank to remove the heavy ‘waste’ and then sent to the grow trays to provide a food source for growing plants in the gravel and the plants provide a natural filter for the water that keeps the fish healthy. This symbiotic relationship between the fish and the growing plants is the goal of aquaponics by creating a sustainable ecosystem in which both fish and plants can thrive and as a result, produces safe, fresh protein and healthy vegetables. Aquaponics systems heretofore developed have not met with widespread success. Previously, aquaponics systems have been complex and labor intensive to operate, difficult to construct because to date, there has been no standard design that has proven itself to be easy to operate, and they are often poorly constructed with inferior materials requiring constant attention to leaks, challenges for disposal of the fish waste, and careful maintenance of pH levels, micronutrient depletion and water temperature. They have also been expensive in terms of the pumps and other electrical equipment required. In addition, prior aquaponics systems have been difficult to maintain and are prone to catastrophic system failures such as death of the fish and plants due to design flaws in the actual aquaponics system. PFAS LLC and their invention, Portable Farms® Aquaponics Systems, has evaluated and resolved the major stumbling blocks (mentioned above) to such a degree that they can be successfully operated by semi-skilled labor to produce healthy vegetables and fish to sustain families, communities and countries. The Portable Farms® Aquaponics Systems duplicate what nature has been doing for billions of years. The water, containing the fish waste, is pumped out of the fish tanks to a settling tank, where the solids settle to the bottom of the tank while the nutrient-rich water then flows, by gravity, through a series of trays where the plants are growing, and then back into the fish tanks. The small amount of separated fish-waste water in the settling tank is drained off at regular intervals, and can be used to fertilize crops such as trees, ornamentals or lawns.The cycle of the water flowing through the system repeats itself several times each day. Some make-up water has to be added at regular intervals to compensate for the water used in the settling tank cleaning, and for the water used by the plants for growth (transpiration). And, that’s how the system works. Simple, elegant and with very little energy to produce high quantities of locally grown food. Is it possible to apply the PFAS to an arid setting in the third world? Simple local material, solar energy, local plants and local level of skills? And can I use PFAS on my balcony over the Scandinavian winter? The answer to your first question is yes there are installations all over the world in many different climates. The answer to your second question a climatically adapted structure is required. How often do you feed the fish per day and how expensive is the fish food? I’m trying to compile a cost analogy for determining how much a small back yard 10′ X 20′ Portables Farms would cost to run for 40 days. I probably will be growing tomatoes, beans, lettuce and bell peppers. The reason I ask is that I once trying raising chickens for cutting cost on buying eggs and it ended up costing me double because of chicken feed. How many fish and how old they are has a major bearing on the feed consumption. With our current system (6′ x 16′ Grow Table) a 50lb bag has lasted over a year. Local cost – US$32. What’s with the 40 days? These systems are year round growing. Good luck in all of your endeavors. – How are the vegatation blooms pollinated ? We will be building a home soon and have always planned on building on site an aquaponics system. Now I am also interested in becoming a certified acquponist. We have very active gardening groups in our area but no big acquponic center. We need acquaponics. Thank you we will be in touch when we start to build the aquaponics system. Building the aquaponics system into a new home setting is a very smart idea. Please continue to come back to visit this site often and you may want to consider taking the Aquaponics Course at Aquaponics University to be ready for your system when you have it finished.